Iranian Azerbaijanis has launched a social media petition to the country’s Supreme Leader Ayatollah Ali Khamenei, requesting him to take steps to revive dying Lake Urmia. So far at least 65,000 people have signed the petition, initiated in Telegram social media app on February 1, aiming to push the country’s leader to take serious measures to restore the lake. The petition will be presented to Mohammad Ali Al-e-Hashem, Iranian leader’s representative in East Azerbaijan province to submit it to Khamenei. The petition reads that the lake’s volume has decreased by 90 percent of its original and the lake’s drying currently is the main concern of Azerbaijanis, as it seriously threats life of over 14 millions of people living in the region. It requests Khamenei to order the related officials to take effective steps and allocate the needed budget for reviving the lake. In recent months disappointments about the save of Lake Urmia, located in Iran’s north western region of Azerbaijan, once the world’s sixth largest saltwater lake, have increased as its situation is getting worse day by day. It seems that the Aral Sea’s tragic fate, a well-known dried salt lake in Central Asia, will repeat itself with Lake Urmia, exposing a salt desert with noxious salt storm, threatening people health and crops within a few hundred kilometers of the lake. 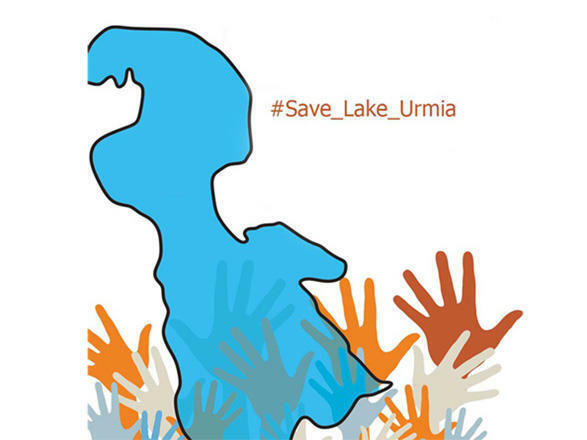 Last year, the "I'm Lake Urmia" petition, signed by around 1.7 million Iranians presented to the UN resident coordinator in Iran Gary Lewis to ask the United Nations to take serious measures to restore the lake. Iranian politicians including President Hassan Rouhani and MPs also refer to the issue from time to time. Rouhani attached a special attention to the issue, during his presidential campaign in 2013 and promised Azerbaijanis to take measures to save the lake. Certain international figures also have made Lake Urmia part of their public advocacy. For instance famous Hollywood star Leonardo DiCaprio’s Instagram post regarding the issue in May 2016 resulted in over 320,000 likes. Some Iranian officials confirm that the program to restore the lake has failed due to the drying up of funds for related projects. For instance, Isa Kalantari, head Iran’s Environment Protection Organization, recently said that the only choice to revive the lake is foreign finance as the planed projects are facing budget shortage. That is why some Iran’s Azerbaijani MPs have recently written a letter to Khamenei, asking his support for allocating the needed budget for reviving the lake from the country’s National Development Fund (NDF)-Iran’s currency-reserve fund. Both “Lake Urmia revive-letter to the supreme leader” petition and the MPs’ letter have addressed to the correct target. Khamenei holds the final say on all political matters in Iran, and if he wants can order directing the budget from the fund to the lake revive projects. It is not unprecedented and over the recent years there were similar cases, in which the supreme leader allowed officials to allocate sums from the fund to certain issues. In the most recent case, Khamenei agreed to the transfer of $4 billion from the NDF for use in the proposed budget for the next Iranian calendar year (to start March 21) for various sectors including $2.5 billion to bolster military capabilities.